Image courtesy Marcin Wichary via Flickr. Used under a CC BY 2.0 license. When I started college, I wanted to be an electrical engineer. In a basic electronics course, I learned about oscilloscopes and got to fiddle with them as a hobbyist. Despite a change in my major to healthcare, I still saw them when working in a hospital, with patients hooked up to an electrocardiogram machine. I thought I would provide an overview of what to look for when buying an oscilloscope in this article. Read customer reviews of the best oscilloscope for the money in 2019 on Amazon. An oscilloscope is an instrument where variations of electrical signals appear temporarily as a visible waveform on the fluorescent screen of a cathode ray oscilloscope (CRO) or the more modern digital storage oscilloscope (DSO). 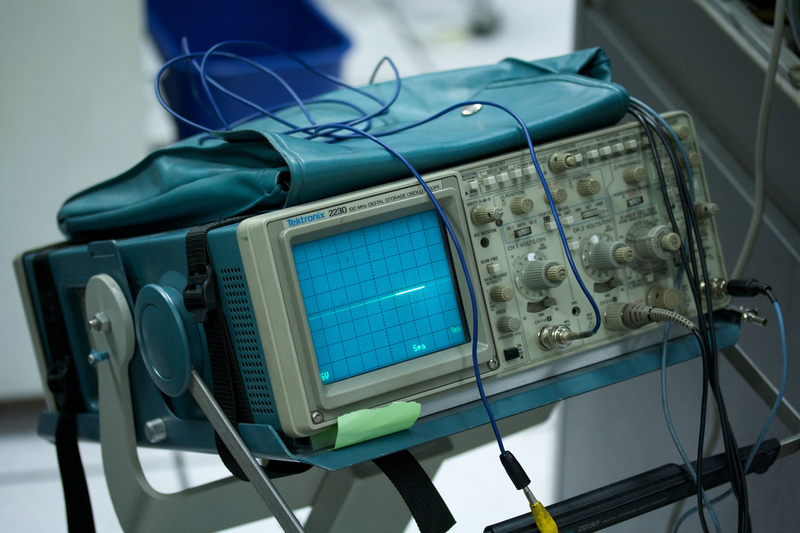 Various institutions and industries, such as telecommunications system, medicine, engineering, and the sciences derive great benefits using the oscilloscope. Oscilloscopes have varied purposes. In the world of medicine it is used as an electrocardiogram to display and monitor the human heartbeat in a waveform. In the automotive industry, the best handheld oscilloscope can help analyze the car’s engine, ignition, braking and stability systems. Be it in any technical field, oscilloscopes have become an integral and indispensable tool in terms of precision diagnosis. A standard oscilloscope for hobbyists is usually divided into four essential sections: the display, the horizontal, the vertical, and the trigger controls, along with intensity and focus knobs, a beam finder button, and a probe. Most contemporary oscilloscopes have now become lighter, more compact and conveniently more portable for easy transport (e.g., in ambulances) and safe keeping. Display – oscilloscopes utilize either the CRT or LCD monitor, with a network of longitudinal and latitudinal reference lines called the graticule. This is the part of the oscilloscope that holds the knobs and the beam finder button. Horizontal controls – this section regulates the time base or sweep of the instrument with the seconds-per-division (SEC-DIV) selector knob. Also found in this section, are the horizontal beam position knob and the horizontal input to plot dual X-Y axis signals. Vertical controls – this section regulates the amplitude of the displayed signal. It is equipped with a volts-per-division (VOLTS/DIV) selector knob, an AC/DC ground selector switch, a vertical beam position knob, and a vertical (primary) input for instruments, such as probes. Trigger controls – this section starts up and controls the time base or sweep, which can be primed to automatically restart after each sweep, or it can be designed to trigger after an internal or external event. Included in this section, are the coupling and source selector switches, level adjustments, and an external trigger input (EXT INPUT). Apart from these vital sections, most high-end oscilloscopes are equipped with a probe that can be attached to the vertical input of the instrument. The probe, with a resistor of ten times the oscilloscope’s input impedance, helps to measure signals and isolate them efficiently. Although oscilloscopes can be used for various tasks, its main function is to probe faulty electronic equipment, such as sound mixers, amplifiers, electronic oscillators, and many others. It can also be used as a signal tracer to look for expected signals or to diagnose electronic components in a piece of equipment. It can be used to conduct safety check on newly designed circuitry for errors in design, electrical interference, or poor voltage levels. For this purpose, choose a dual-trace oscilloscope featuring clock signal and a test signal that is supported by the clock. State-of-the-art oscilloscopes can store signals for longer periods. This feature allows the user to examine stored data and obtain a broader picture of related issues that can be handy for future troubleshooting. Nowadays, digital storage oscilloscopes (DSOs) are the go-to gizmos for modern-day professional users, from automotive mechanics to medical technicians (including EMTs) to sound engineers. The advent of advanced technology has virtually driven manufacturers to refrain from further making analog oscilloscopes. They cite the analog’s limited performance and accessibility of much needed spare parts, making it just about obsolete. DSOs are designed with great innovativeness and high performance in mind, and are simply more advantageous than analogs. They are compact, lightweight, and portable. They support storage and printing. They possess the highest bandwidths. They afford on-screen measurements; provide color displays; have single-shot ability, and offer simple user interface (for PC-based DSOs). Obviously, steering away from analogs makes good economic sense. Nevertheless, you have to consider what you intend to use the instrument for and where – on your car, in an electronic shop, on a bench top, in the lab, or in an ambulance. This will ultimately guide you eventually in buying the oscilloscope that would serve your purposes best. Bandwidth is the range within a band of wavelengths or frequencies. You must choose digital oscilloscopes with bandwidths five times higher than the maximum frequency of the signal needed to be measured. This will ensure a more precise image of the waveform. If you will be measuring frequencies of around 100MHz, for instance, choose an oscilloscope with bandwidth of 500MHz. This limits the error to only 3%, compared to an error margin of 5% for a 300MHz oscilloscope. For analogs, a bandwidth of twice the highest signal frequency to be measured is usually adequate. Be extra vigilant when buying, check the specifications or data sheet as some scopes have no available bandwidth on all voltage ranges. Nearly all oscilloscopes feature two distinct sampling rates or modes – real-time sampling (RTS) and equivalent-time sampling (ETS). RTS is a few magnitudes lower in sample rate than ETS, and works well with transient, single-shot, or varying signals. ETS, on the other hand, works well only when measuring signals that are stable and repetitive because this method operates by boosting the waveform through successive acquisitions. Sample rates must be at least 4 times the bandwidth. The buffer memory of the DSO stores captured samples, and its size will determine the length of time to depict a signal before the memory is totally full. Sampling rate and memory depth are closely interrelated since a DSO possessing a high sampling rate but small memory input would only be capable of drawing its full sampling potential on the topmost time sweeps. The task in buying an oscilloscope should not be too daunting with these extra tips we are sharing with you to end this article. Try to compare as many different scopes as possible from various brands or manufacturers. Go for suppliers with guaranteed craftsmanship. 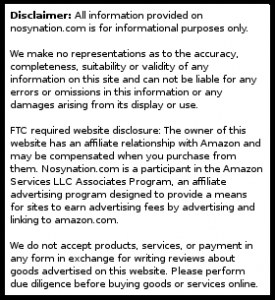 Read the warranty provisions. Find out about the interface ports available in the equipment, especially if you will be using it with remote instruments, USB and Ethernet connections. Aim for sellers that allow demos with actual signals you would like to measure, not prearranged ones just to show the strong points of the instrument. For PC-based oscilloscopes, verify if the software is integrated into the instrument and clarify whether software upgrades will be free. Search online for independent reviews of oscilloscopes – look for “oscilloscope review” on Google. Oscilloscopes can be in bench-top, handheld or PC-based form. Choose depending on your purpose. Bench-top scopes will be very stable in terms of performance. Handheld instruments will be more portable but often more inferior to bench-top types. PC-based are easiest to export data from and interface with other applications. By this time you should have, at the very least, a good grasp of the best type, brand and make of oscilloscope for your purpose. Higher specs will naturally entail higher price. Buy wisely and don’t pay for features and functions you don’t need. Find the best oscilloscope for automotive, car audio, or hobbyist uses on Amazon.